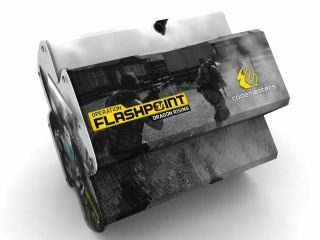 Codemasters and Intel are offering the chance to win a high-end gaming PC for those picked out as the greatest level designers for its popular Operation Flashpoint: Dragon Rising game. The game has an included mission editor that allows gamers to construct their own version of level heaven, and then put it out for the public. The competition, which is already likely to lure in a large slice of the Flashpoint community, is adding to its appeal by offering rather lovely prizes for the top two levels. This comes in the form of a heavily branded PC which is valued at over £1,200, featuring Intel's Core i7 as its processor. "Create your own mission with the Operation Flashpoint : Dragon Rising mission editor and win a limited edition design by Invasion Operation Flashpoint : Dragon Rising desktop PC equipped with Intel Core i7-960 processor, Intel Corei7-860 processors, and some Operation Flashpoint : Dragon Rising collector goodies!" says Codemasters. You just need to pop along to http://www.intelofpdrcontest.com/en/ to check out the rules and things you need to include, put together your level and then keep your fingers firmly crossed.